(TibetanReview.net, Nov26, 2018) – China said Nov 24 that it had reached some important consensus on boundary issues with India during the two side’s meeting that day in Chengdu, capital of its southwestern province of Sichuan. This was the 21st round of talks between Chinese and Indian special representatives on boundary issues and it was co-chaired by Chinese State Councilor and Foreign Minister Wang Yi and India’s National Security Advisor Ajit Doval, reported China’s official Xinhua news agency Nov 24. The report cited a press release from the Chinese Foreign Ministry as saying the two sides will jointly safeguard peace and tranquility in the border areas before a final settlement of the boundary issues. Besides the border dispute, the two senior officials at were also to review progress made in bilateral ties since the Wuhan Summit between Prime Minister Narendra Modi and President Xi Jinping in April, India’s PTI news agency Nov 24 cited officials as saying. 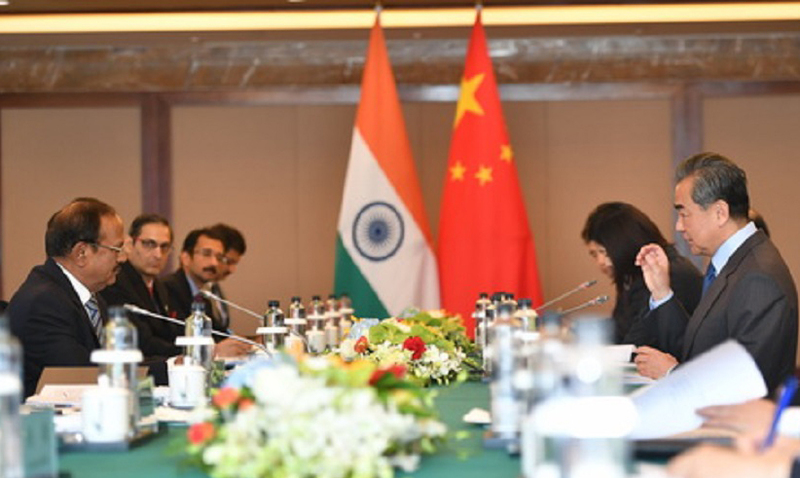 In this connection, the Xinhua report cited the press release as saying the two sides took the view that China-India relations had witnessed comprehensively positive progress and stepped into a new development stage after an informal Xi-Modi meeting in Wuhan in April. It further cited the press release as saying the two sides will continuously strengthen strategic communication, lift political mutual trust and expand exchanges and cooperation in various fields to usher in a new level on the China-India Closer Developmental Partnership, it said. It also cited officials as having maintained that the latest round of talks were likely to focus more on reviewing the progress on trade and maintenance of peace at borders than movement towards a solution to the border dispute as India was headed for general elections next year. The report also noted that negotiations between the special representatives were regarded as highly significant by both the countries as they cover all aspects of bilateral ties besides making efforts to resolve the vexed border dispute. It cited officials on both sides as saying a lot of spadework had been done to ensure peace and tranquillity at the border, though the solution to the border dispute was elusive even after 20 rounds of talks. When the Chinese offer peace, India should be wary. According to Sun Tzu, when preparing for war offer peace. It may not be military but China is definitely up to something sinister. Don’t let Xi-Modi romance in Wuhan end up like the 1962 “Hindi Chini Bhai Bhai” debacle.